Our team is made up of Toyota Land Cruiser lovers, and it shows. They are experts in everything related to these iconic vehicles including engines, drive trains, electrical, bodywork and parts. 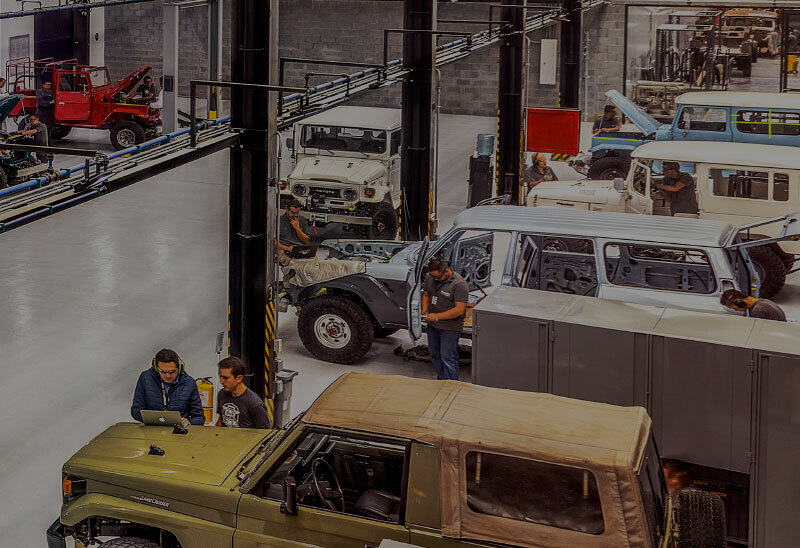 Throughout their combined lifelong careers, The FJ Company's specialists have worked on hundreds of Land Cruisers and built thousands of engines. We have a single goal in mind: To deliver the best Land Cruiser custom builds in the world. Think you have what it takes to join this team? Check out our available openings below. Miami is the main hub for The FJ Company in the United States. The Senior Service Technician is a technical and hands on position for a candidate with at least 10 years of experience in all aspects of Toyota vehicles. Candidates with specific experience with 40 Series vehicles, ASE certifications, and/or Toyota Master Automotive Technician certifications will have an edge in the selection process. The candidate will work alongside our Chief Technician and be primarily responsible for servicing The FJ Company vehicles built with 2F, 1FZ, and 1GR-FE engines. The Senior Technician will execute warranty service, upgrades, regular maintenance, engine rebuilds, and re-wiring of vehicles. Occasionally, the role requires working on special projects for the company, such as purpose-built vehicles, demo vehicles, and such. To be successful in this position, the candidate must demonstrate a highly technical understanding of the power-train and drive-train in Toyota Land Cruisers. The candidate must be proactive, self motivated, and have excellent written and verbal communication skills, including proficiency in English. At least 10 years of experience in a similar role is required. To be determined based on the qualifications and experience of the candidate.